Thai combat is a realistic fighting system developed by Master Andy Cole 5th dan. 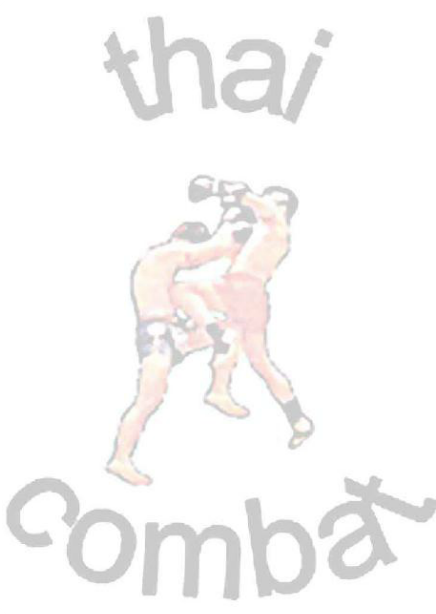 The origin of Thai Combat comes from Muay Thai. With its wide variety of striking and defence techniques against various striking attacks, Muay Thai is a well rounded, full contact, 'stand up' fighting style. Many techniques from other styles of fighting were carefully analysed over many years and have been purposely selected to form a well balanced combination of offensive and defensive techniques, from both unarmed and armed hand to hand combat. Each technique in Thai Combat has three forms: to give minor, major or lethal injuries to attackers. Thai combat is a full contact fighting system where we use punches, kicks, knees, elbows, throws, chokes, headlocks, wrist lock, arm locks and many other techniques. We also defend ourselves from weapons such as knifes, sticks, baseball bats, bottles, axes, hammers and many other types of weapons. Andy's interest in fighting and self defence began by learning the art of boxing. Boxing was a great starting base for Andy but he wanted more. So he started Muay Thai and full contact kickboxing because combined together they offered a greater variation of fighting in which the use of kicks, knees, elbows and punches are allowed. Muay Thai is a fantastic stand up fighting art but again Andy found himself needing more variation. As his thirst for knowledge grew, Andy studied different fighting styles over many years and combined them into a realistic fighting system, know today as Thai Combat. Over many years Andy has taught people from various selected backgrounds including Police, Prison Officers, Doormen and Close Protection Security Personnel. One of Andy's original students now runs a large successful security company, in which he has built from scratch, where at the beginning; the security team just consisted of just Andy and himself. Now, through the skills and confidence acquired through training with Andy, studying Thai Combat for many years, Arif has enjoyed the growth and success of supplying over 120 door supervisors to clubs and pubs while also managing various other security contracts and close protection. Andy would like to thank grand master Angelo Baldissone, sensei Mike Mitchell and Sensei Kevin Hughes for all their help and support over the years. Thai Combat is affiliated to the Filipino Kyusho system.